Currently unavailable to order. Expected to arrive in 5 days. Want to be notified when stock arrives? Whoops! That looks like an invalid email address. Thanks! We'll email you when it's back in stock. This collection of vegan truffles makes an ideal gift for friends and family who have decided on a completely animal free lifestyle. They have a delicious taste and beautiful texture exactly like those made with butter and cream! 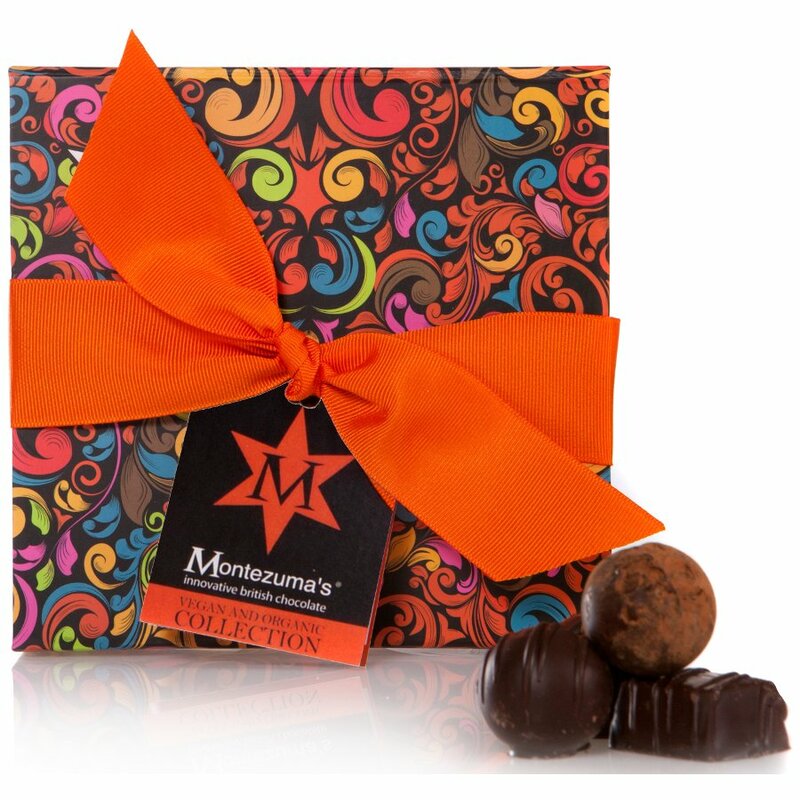 The organic truffles are also free from GM ingredients colourings and preservatives. Quick Fix - Organic Dark Chocolate (Organic Cocoa Solids 54%, Organic Ground Vanilla & Emulsifier: Organic Soya Lecithin), Organic Dark Chocolate (Organic Cocoa Solids 73%, Organic Sugar & Organic Ground Vanilla), Organic Fondant, Organic Coconut Oil, Organic Wheat Syrup, Organic Coffee Granules & Emulsifier:Organic Soya Lecithin. Creme de Cacao - Organic Dark Chocolate 78% (Organic Cocoa Mass, Organic Sugar, Organic Cocoa Butter, Organic Vanilla), Organic Fondant 16% (Organic Sugar, Organic Glucose Syrup & Water), Organic Coconut Oil 2%, Organic Cocoa Powder, Organic Wheat Syrup* & Emulsifier: Organic Soya Lecithin. Moondance - Organic Dark Chocolate 64% (Organic Cocoa Solids, Organic Sugar & Organic Vanilla), Organic Almond Praline 36% (Organic Sugar, Organic Almonds & Emulsifier: Organic Soya Lecithin). We are not the manufacturer of the products sold on our website. While we work to ensure that product information on our website is correct, manufacturers may alter their product information. Actual product packaging and materials may contain more and/or different information than shown on our website. You should always read the labels, warnings and instructions provided with the product before using or consuming it and not solely rely on the information presented on our website. 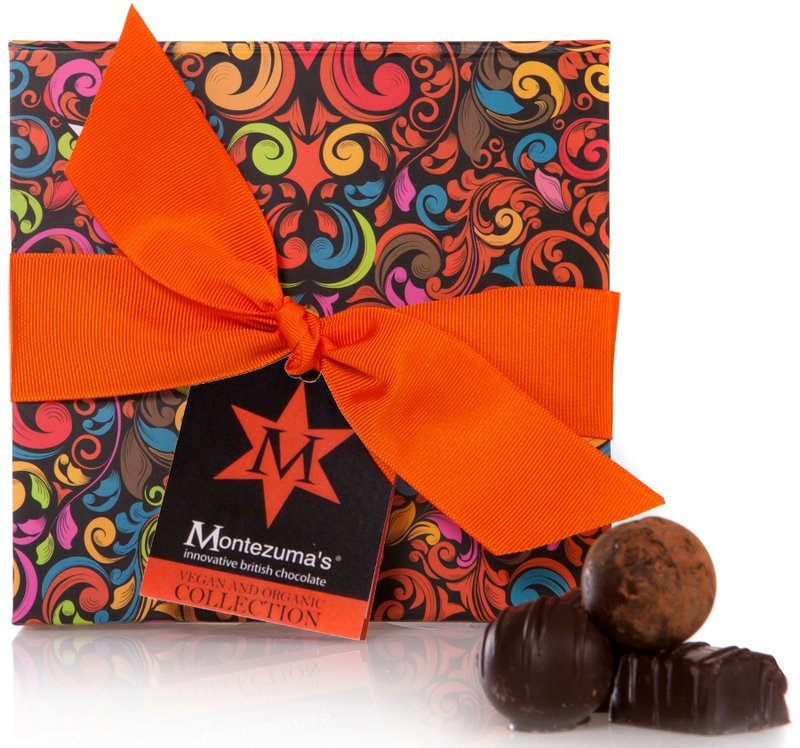 There are currently no questions to display about Montezuma's Vegan Truffle Collection - 200g. Delivered via Hermes courier. UK orders will normally be received within 5 working days.Choose this option if you're not in a hurry to receive your order and we'll use the most efficient delivery method possible. Delivered via DPD courier, requires a signature upon delivery._Delivery next working day for orders placed before 2pm (Mon-Fri). This method will require a signature, please ensure somebody will be available to sign. You will also receive tracking alerts via SMS/email from DPD to keep you updated on your delivery. Please see our Despatch & Delivery page for more information on delivery areas, services and charges. © 2019 Spark Etail Ltd, registered in England & Wales No. 7551349. All rights reserved. Registered office: Follingsby Avenue, Follingsby Park, Gateshead, NE10 8HQ. For more information see about us or browse our sitemap.